Today, I’m celebrating my 50th birthday! I’m thrilled to be doing it at normal weight, since I was overweight on my 30th birthday and obese on my 40th. I believe in miracles, the power of community, and my ability to transform my life. Those are good things to believe in at any age. Since buying myself a cake isn’t in my current food plan, I’m celebrating with Chocolate Chip Bread. The original recipe came from allrecipes.com: Chocolate Chip Bread II Recipe. Of course, I changed it to make it a little healthier — some whole wheat flour, a little less sugar and fat. It’s still not health food, but a satisfying alternative to cake. Chocolate Chip Bread tastes wonderful either fresh out of the bread machine or toasted. It’s good with nothing on it, but I like it with yogurt cheese mixed with just enough mayo to make it a good texture for spreading. The tangy yogurt flavor contrasts nicely with the sweetness of the bread. The secret to chocolate chip bread is to freeze the chocolate chips and add them five minutes before the end of the first kneading. Otherwise, the chocolate chips melt and you get chocolate bread, which isn’t bad but not quite the same thing. 1. Stir together whey, egg, sugar, and salt in small bowl or measuring cup. 2. Measure the flours into a bowl. Chop the butter into several pieces and stir into the flours. 3. Pour the liquid ingredients into the bread machine bucket. Top with the flours and butter. Make a well in the center of the flour and measure 2 teaspoons of yeast into it. 4. Add the frozen chocolate chips when the “Add” signal beeps or about 5 minutes before the end of the first kneading cycle. Find more recipes and other food stories as we celebrate Weekend Cooking at Beth Fish Reads. Happy day to you! And congrats on the weight-loss journey. This bread looks great. Happy Birthday, you look great! Happy Birthday! 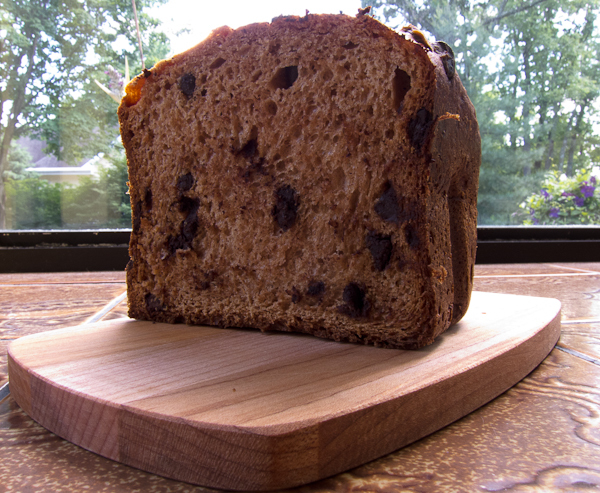 Chocolate chip bread is a great way to celebrate. Joy! Happy birthday! (I’m going to be 50 in 1 month.) You look GREAT in your picture and this is a smart, but at the same time tasty looking recipe! happt birthday! enjoy the bread! Happy Birthday. I’lll be joining that club in August. First–HAPPY BIRTHDAY!! 🙂 I hope you have a very beautiful day. And wow–the bread. Sounds delicious. Chocolate Chips make everything better, huh?! Happy Birthday, Joy! Your bread sounds lovely. In France they have this “pain au chocolat” which is very delicious, but the dough is totally different, much less healthy, but, oh, so good! Hope you had a lovely birthday. The cake looks good too. Happy Birthday and many congratulations on being your ideal weight. It sounds as if you’re determined to maintain it with sensible eating too – don’t forget to have a little treat now and then. This bread looks delicious. Happy Birthday! What a lovely and different chocolatey way to celebrate your birthday. I made sweet potato chocolate brownies near my birthday, which are supposed to be more healthy then ordinary brownies… They were actually quite nice but they didn’t say exactly how much less fat they contained. I figure though it must count towards eating a vegetable… even if it’s covered in chocolate, right? Counting a chocolate-covered vegetable works for me — at least on my birthday! What a great way to celebrate! Happy birthday to you! Happy belated birthday! I hope you had an amazing day. I need to try this bread. Thanks! It really is good bread.